I cast off and headed out of the anchorage. Just as I passed Fleming cut, Jerry and Trina came flying up on Pony to see me off and take pictures. They had to turn back soon before they ran out of gas, so I waved goodbye and headed west down Hawk Channel. The wind was light, and I rigged a preventer for the jib so I could run wing and wing, makes it easy having the aka to tie the preventer to. 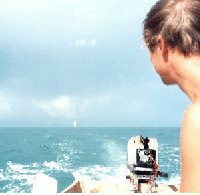 By mid day I was becalmed off the Tortugas, creeping slowly under an updraft marked by a line of clouds. Finally made it through and picked up a nice breeze. I noticed another boat, spinaker out, coming out of the Marquesas on a parallel course. As the afternoon wore on and the wind picked up, I walked away from them till they disappeared below the horizon. Nearing sunset the wind was building up strong and I had cleared Half-Moon Shoals Light and was making for Rebecca Shoals Light. I decided to alter course for the Tortugas and rest for the night, since I had made such a slow passage through the day. I could take advantage of the landfall to get a night's sleep and maybe a hot meal. The wind built to strong and I made for the Tortugas at high speed, reaching 9 knots at times, a lot of spray and breakers from the aft starboard quarter. It was beautiful sailing though, as I was able to set my course on Venus, which was bright enough to lay a track on the water, and I sailed up it. As Venus came down to the horizon it was replaced by Loggerhead Key light in the Tortugas, just as I'd hoped. I made a few waypoints to run me inside through the southeast channel, and then cut NW for loggerhead key in pretty rough conditions. I was running almost blind, with no good idea of the lay of loggerhead, but I went to round the south end, made it clear, then hung up on a crab pot that tangled around the foil. It took me a long time to get free, it seemed like it just kept reattaching itself, or I couldn't find it when it did. Finally I was free and making my way up the west side of loggerhead. I was making to beach near the light, when I ran into some submerged wreck, quite a racket, and as I jumped up to see what was up the sprayskirt fell overboard, the stretch rope I'd tied it with doesn't hold a knot, so before I realized it was unattached, it had disappeared into the night. I searched around but no luck. Dead tired at this point, I headed for the south end, and dropping sail fairly far out, I laboriously paddled in, encountering nothing till I came up to the beach. I anchored there, just off the beach and slept. In the morning I raised anchor and continued south a ways till I could beach right on the southern tip. I walked up the beach a good ways hoping I might find the sprayskirt washed ashore, but no such luck. So I cast off and drifted south on wind and current, having a time of it getting the main up. I really can't recommend the system, definitely not designed by anyone intending to have to do it somewhere other than a nice stable beach or parking lot. This is a significant moment as I turn the nose southwest for Mexico, so many miles away and head into the open water. I am committed, though it feels good and conditions are right. I'm still running wing and wing, dead on my rumbline with the wind dead astern. I pass the final buoy of the Tortugas and head out into the Gulf, into blue water. I'm checking my position every hour to try and see if the current's anything to worry about, but it seems I've done right to come so far west. Toward mid-day the wind has nearly died. I actually have to turn back N to get some speed and get away from the path of a freighter. Several go by, and I hail one on the radio and talk to him a bit before we're cut off, I think that's when the radio mike broke down. I see one sail heading northwest towards the Tortugas and that is all. I can't raise them on the radio, but I think the mike was dead when I tried. The wind picks up suddenly at 12:40 and I start moving along. I have a great run through the rest of the day as squalls build around me and the seas build as well. At one point I try to foil, even running west to get a broad reach, but I am unable to get her to come up, so I turn back to course, since the storms seem to be more in the west. I am running well, cutting through notches in the squalls and most of the weather continues to move off to the west through the afternoon. The blue water is so beautiful a color. I am oddly pleased, both by its beauty, and that it means I have arrived. I am in the "blue water" now. As the sun sets the wind is dying again, and I move south through a massive swell with a great thunderstorm to the west. In the sudden illumination of the lightning what I see reminds me of places in the high mountains, the towering clouds like ragged peaks surrounding a huge basin that extends away in great rolling swales. It is so familiar it is amazing. The swells are huge, though the waves are gone, great gently rolling hills of water with only the lightest riffles on the surface. After I am clear of the storm, I point the boat west, intending to give myself a hedge against the current if the wind dies. I take off the mainsheet tackle and let the main fly out and let the jib out full. After trying to sleep in the cockpit, I climb out and find I am actually quite comfortable lying on top of the fore cockpit, now filled with gear, and I stretch out and sleep as the boat drifts west. The air is calm, and soon the swells disappear and I am drifting in a flat sea. Around mid day I start noticing small streaks of wind here and there and I get out the paddle and start heading SW. I tell myself, "if the Maya could do it, so can I". Though my main intent is paddling across the calm stretches is to catch the wind streaks and take them W-SW, off-setting my drift in the current as much as I can. I have been studying the sky, and I can distinctly see the landmasses reflected in the clouds over them. Cuba to the south, Mexico to the west, and the opening of the Yucatan channel between them. I can look back and see Florida behind me. I actually feel I could cross this gulf without even a compass, relying just on the clouds to tell me where I was. The Gulf really seems small now, bounded on most every side. In the late afternoon I see a disturbance on the SW horizon, which resolves itself into huge pod of dolphins heading directly towards me. I don't know if they heard my paddling, or some sound the foils make when I am sailing, or if it is just luck. The main pod made of many groups must number a couple hundred. On the edges occasionally a lone dolphin leaps high and splashes. It appears from their actions that the leapers are spotting fish and calling the others to feed. When they pass me many of them stop to circle me and swim under and around me, but not for long and they are all soon gone, heading to the Northeast. These are almost the sole signs of life on the entire trip, except for a handful of little fish under the boat as I move past great rafts of sargasso weed. I work as hard to try and cut through the easiest ways and avoid the thickest and most continuous patches. At sunset, the wind returns at last. I have done well; I am only 5 miles east of my rumbline, having started out 5 miles west. As the sun sets I have reached my rumbline and am headed southwest again, veering slightly west in case the wind dies again. I am running easy in a moderate breeze, good phosphorescence and beautiful clear skies. The wind drops a bit around 4 am, and I finally get the boat to balance with the main loose and the jib tightened a bit. I leave the boat running SW and sleep on "deck." There is a heavy overcast ahead when I wake, obviously filling the Caribbean Sea and moving up the channel between Cuba and Mexico. It looks like rain and weather ahead. I rig the rear cockpit cover so I can use it as a spray skirt. Through the day the wind builds and I run down in moderate seas. Nothing like the first day out of the Tortugas. There is no great swell running, just a level sea with 2' to 4' waves, with higher rogues. It is a sea of whitecaps. I keep playing with ropes tied to the rudder, trying to get the tiller lashed just to rest my feet. I get it once and am able to stretch out for a while. Late afternoon and I know I am beginning to parallel the Cuban coast. Storms are building and just before sunset a major squall line comes out of the East and runs over me rapidly. For a short while I am forced to turn downwind and run with it, while the waves quickly jumped to 5' to 7' and I am surfing and jumping. Just as I am ready to drop the main the squall outdistances me, and the wind moderates to just strong. Though much colder and stronger now, the wind moderates and steadies. I turn back south a bit to get back on my rumbline, and after a few rough miles taking seas, I'm able to head SW with the waves astern or quartering. The squall line develops into an incredible sunset. Even in the rough conditions, I dig out the camera to take some pictures. I run on down the coast, outlines of thunderstorms to the South and East, seeming all too close in the night. It is very cold now, but I am running fast on a medium sea, racing along through the night. I don't want to stop because I know I am making miles. The sky is incredibly clear, the Milky Way is as solid as a cloud, the stars are hard and sharp. The phosphorescence is absolutely amazing. It isn't just the huge comet tail of sparkles I'm leaving, but the sea is full of glowing creatures of all sizes. There are great globes a yard in diameter. When the foil hits one it stretches out into a great ribbon a dozen or more feet long and is visible rising in the wave tops behind me for a mile before I lose sight if it, glowing like fire. I sail on in a wonder till I am near passing out. Several times I start awake with Further pointing south towards Cuba. 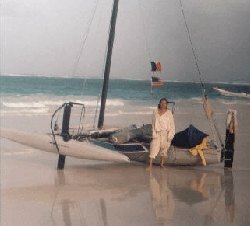 I finally take down the sails and throw the tarp over for a sea anchor, not wanting to chance drifting or sailing to close to the Cuban coast in the night while I sleep. I curl up inside the cockpit and sleep. I wake up with the wind still strong and have a hard time getting the sails up in the rough seas and wind. I keep wishing I had one of the guys who designed this stupid rig here so I could make him do it while I watched. Finally get it up and start running down the coast. It is a beautiful day, though still chilly. The wind eases a bit at noon, and storms start building along the coast. For a while I am looking for a gap, starting to steer a bit south, until I realize that they are the coast and aren't moving and I will never cross them. In fact, the end of Cuba is very apparent in the end of the line of storms. The wind picks up with the afternoon and the seas build to 8' as I begin to draw away from the coast now. I am actually clearing not the end of Cuba, but the eastern point of a great bay on the west end of Cuba. Still, I am moving out into the Yucatan Channel, heading for Mexico on the last part of the passage. Though I haven't had to clear the coastal storm line, storms are now appearing all around me as the sun sets. I sail on through the dark, surfing now in great waves and strong wind; lightning showing in storms scattered all around me. I am doing 10 knots and more, and I think that I might actually make it there overnight if I can keep this up. The boat is amazingly comfortable in these conditions and I am very impressed by the engineering and design of the boat. As long as I keep her running downwind and wave, there is no problem. When a big breaker comes up behind me, it catches the boat amidships and with the crest poised right beneath the crossbar, I surf ahead, the front foils lifting the nose up so I stay level, while the rear foil holds me back in the wave so I don't go forward till the wave has broken. I actually learn to relax and sit back as I hurtle through the night. Finally a major squall line with lightning is advancing on me out of the southeast, and I turn up and drop the main, struggling against the force of the wind and rain now that I'm not running with it. I sail on under the jib alone, turning south to cross the squall line quickly at a good point, taking a heavy beating till it passes over, then I am turning west again, though tending south as I can see massive thunderstorms moving across the channel to the west. As the storms pass I am left in a huge swell and stiff wind, though the breakers are gone now. I am in the vicinity of Cabo San Lucas light, off to the south. I'm just clearing the point of Cuba now. As the air clears I am able to see freighter appearing all over. There are four of five to the NE heading south and a couple coming up from the south. I sail on under jib along, heading west to get away from them, not wanting to raise the main in case another storm comes up. I watch freighters come and go. Once I am startled as a freighter I'd seen coming up turns broadside while I'm not watching. To my sleep-deprived mind and panicked eyes it looks like the bridge of a ship or a barge coming right towards me, almost on top of me. And since we are actually running parallel courses, in my mind I'm unable to get out from in front of it even as I sail. I haul out the spotlight and one pass shows me not an approaching bow, but a freighter broadside and moving away slowly. It was the only time in the trip I was ever really scared. When I was digging out the spotlight in a panic, the remaining spray-cover goes over the side unnoticed. Finally I am free of the shipping lanes. I move the canopy that Trina made for the front cockpit back to the rear and set it up there to replace the lost spray cover. I pull it up and over, almost closed, and go to sleep in the cockpit, sailing west through the darkness under the jib alone. I sleep late, though I probably didn't go to sleep till just before dawn. I'm underway in 40 minutes, eating and raising the main, and I have been getting somewhere under the jib as I slept. I am now moving out into the channel for certain. The wind has built and the seas are up from 5' earlier to 8' now, and huge storms are building all around me. I am running fast for Mexico now, if I can just avoid the storms. I try foiling but the starboard foil refuses to come up. I am still making 8 to 10 knots, possibly averaging more with the surfing I'm doing. I set course for Isla Mujeras. In the late afternoon a really ugly front is catching me from the east, and I decide to haul down the main. The minute I start to turn up, the boat pitchpoles, tripping on the starboard aka. I somehow keep it all together. Hanging by one arm I grab the camera from behind the seat and drop it down into the main body of the boat, then loose the sheets. I drop down and land on the crossbar, then grabbing the net I haul the boat down. 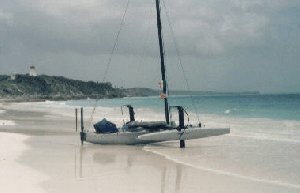 The moment I get the tip of the sail out of the water, the wind catches it and we spin up and fall back right side up. I immediately climb back on and drop the main and lash it solidly. By that time the storm is on us and in a moment it turns to a full gale and I am forced to drop the jib as well. 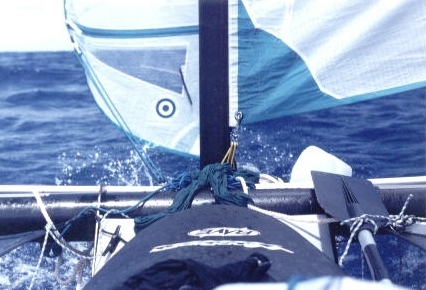 I can't get the jib sheet shackle loose, it is much too tight for the condition of my hands and the flapping of the sail. I release it and in a moment it has flogged a hole in the jib, but I am doing the only thing I can. I jump into the water, the only stable place to work, and haul down the sail with the sheet attached, lifting myself clear out of the water before my weight is enough to drag the sail down foot by foot. I remember thinking about how much trouble this jib was and that I had thought of bringing my own hanked jib that I could have raised and lowered quickly and easily. Finally I had it down and aboard. The boat actually "hove to" naturally without sails, moving at 2 -3 knots, quartering into the wind. The storm was howling so I did the only thing I could do, I curled up and went to sleep. I slept comfortably, the boat riding easy, and the canopy actually keeping out all the wash of wave crests on the deck. But as I slept, I noticed a sound once, a scraping. When I woke later after the storm had blown itself out I still heard it, the sound of metal scraping metal. It didn't take a long search to find the source. A weld had broken on the starboard aka, one that had held a bracket to the frame that supported the front end of the aka. There remained only one bolt holding it on, through a similar bracket in the rear side of the crossbar. I dug out the spare anchor rode and proceeded to lash the aka to the crossbar solidly. By this point night had fallen. There was actually a cruise ship to the south and a freighter to the west. The lights of Cancun were visible in the sky a bit south of west. The radio doesn't work, so I can't hail anyone, just to give a time and position, really, since I don't really feel I'm in trouble. I raise the jib, but decide against the main until I can inspect the damage better in daylight and watch how the aka behaves as I sail under the much greater force of the main. But the wind is light, and I drift slowly north unable to stem the current, and the lights of Cancun and the ships drop away to the south though I sail all night. In the morning, I am able to see that is the only damage, but I also need to stabilize the aka a lot more. I run a rope off the top of the foil support down to the nose of the aka to hold it up. I also run ropes front and stern to the main hull to dampen sidewise movement. Then I raise the main and begin to drive south against the current. I am unable to make progress against the current, though I am moving at probably 6 knots. Massive storms are moving and building to the east and north. I adjust my course west until I start to make progress. Though I am heading S/SW, I am making good about 22 degrees (W/SW), ferrying against the current. As the sun sets I am still moving good, have to sail all night now that I am so close, with the weather still likely to deteriorate at any minute and the current still ready to take me away. I can actually feel the presense of shallows to the west, almost as if I was running down a coast. Just before dawn I think I see the loom of lights on the western horizon, far off. 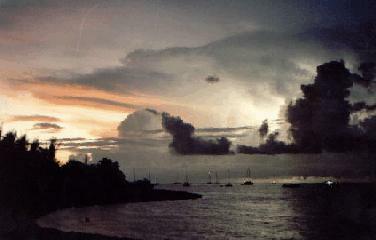 As dawn approaches I sense clouds massing in front of me, occasional lightning ahead, a new tropical wave. As the light brightens enough to see, I face a massive storm moving in from the south. I try heading east to try to round but instead see a whole line of storms extending out to the East and SE, I head west and drop the main as the storm is almost on top of me, as ugly as any I've seen. The place I'm in is like a great hall now, with arched passageways leading outward, the passages between the storms, openings leading West and NW. I am tired of losing ground. So I turn South and head directly into the storm, a wall of cloud with a core of lightning-shot rain behind it. Before I even reach it, I lean my head on my hand for a moment and instantly fall asleep. I wake up to sunshine and blue skies, still with my feet on the rudder pedals, still heading due south. The storm looks even worse behind me, dwarfing the simple thunderheads nearby, a great solid cake-like mass of cloud. I have no idea how I did it. I get up and raise the main and begin racing across a great blue circle, almost like a bay in the open sea. Clouds are building in a line ahead and I already choose a way between the storms to slip through. There are fish now, though I can't see them clearly, and as I near the storm line, I spot my first fishing boat, heading the same direction as I.
I am only 20 miles out as I cross the storm line and adjust my course to the west for the final run to shore. I immediately come upon anchored trawlers, not a good sign. I am racing down the huge swells practically following a line of trawlers for a short while. A fisherman sees me racing by and waves and shouts "hola!" A raise an arm in greeting. It is good. Ahead I can see huge storms moving almost west to east in front of me, black an dropping lightning. I keep on, but soon I drop the main and keep on under the jib. The storm finally hits, and at first I am able to keep my course, but finally the force of the storm increases to the point where I am being driven SW. I look at my chart and see no easy landfall, so I drop the jib and hove to rather than be driven too near shore. I am 17 miles out now. As soon as soon as the wind eases I am out to raise the sails, but I notice that the same weld that broke on the starboard aka has broken now on the port aka. I dig out the spare anchor line I brought and use it to lash up the port side to match the starboard side. Then I raise the jib, and though its still raining, the main as well, and head for the coast. I set a course for Isla Contoy, the closest landfall, with a lighthouse and a description in my guidebook. I am very tired and don't want to go any further than I have to. I am running fast through the night, a choppy sea with great rolling swells left over from the storm. I feel like I'm flying a small plane over sagebrush flats at ground level, a bumpy fast ride. I have the definite impression of going downhill as well, like the sloping steps of the desert flats that empty into the desert plain. I am exhausted, but I see the edge of the clouds approaching ahead, and stars beginning to show beneath it. I was right to keep on. After hours of hurtling on through the dark one star begins to pulse on the horizon and I bear for it, Isla Contoy Light. Even then, in the hypnotic fixation on that light I would suddenly drift off and snap up to find myself off course, having to correct again. Finally I am close enough to line myself up on a compass course that will carry me in clear of the island, unseen in the dark, and come up behind the lighthouse. I flew in to glide over the calm water behind the island. Though I experienced a final strange episode. As I tacked back into shore to anchor, I would be swept back out to sea. I tried three times before recognizing that there was an incredible tidal rip going on, so I took a much wider tack, and then shot in fast for shore, coming up short and anchoring a few feet from a bank. "Landfall!" I wake up in the early morning to the sound of surf and seabirds, clouds already massing in the early morning sun, not a soul in sight. I am still tired and sore, more quietly satisfied, grateful and respectful than excited or relieved, more surprised somehow that the passage was finished. In many ways I would have been happy to continue on over that blue water. I spent a little time straightening up, ate some food, and belatedly raised my Mexican and Q flags. The clouds were already moving out of the west, but now I was able to seek protection and harbor was not far ahead. I run south on the protected west side of Isla Contoy, noting little coves along the route, happy to be exploring new territory. Soon I veer from shore and set course for east shore of Isla Blanco which I'll follow out till I clear the reef extending south from I. Contoy and can head out south west for Isla Mujeras, my port of entry. I move along between reef and shore, actually using my guidebooks for the first time, watching the small traffic of tourist boats and fisherman, making good headway, feeling relaxed. By noon I am clearing the end point of the reef, following a cabin cruiser, and setting course for Isla Mujeras. Looking out across I see Isla Mujeras clearly now, and a dark line of storms moving in, obscuring Isla Mujeras even as I watch. I have just enough time to turn and run back behind reef, then drop main and wait out storm running back along Isla Blanco under the jib, trying to avoid both reef and shore in the blinding downpour. As the storm passes I anchor in shallow water over sandbar I passed on the way to raise main and head back to round reef and set course for Isla Mujeras again. 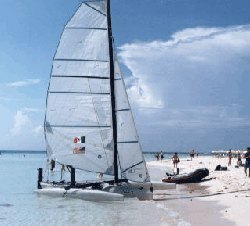 This time the weather improves and I'm sailing in sunshine out over the Bay of Cancun. I am only a mile away from I. Mujeras when I pull up and luff for a moment, ostensibly to look at my guidebooks for information on where to land and the shape of the harbor. But I really pause to take it all in for a moment, the island ahead of me, the water, clear 50 feet to bottom just like it used to be in the Keys, the sun and clouds and ferries shooting out of the water, launches buzzing about like waterbugs, and the specks of seabirds circling and diving, white buildings shining in the sun. I hadn't touched land at Isla Contoy, only anchored, so this was indeed where I would first touch land. I let the boat drift a minute and just lay back and looked at it, knowing that I'd soon be back in civilization, busy with the legalities and practicalities of entering the country, back among people who lived normal lives, while I was yet echoing with the experiences I had just lived. I was full of the sea and storm and sun, the great distances and simple powerful energies I'd become one with and in many ways did not wish to leave. But I heaved myself up, slipped into the cockpit, hauled in the sheets and raced for the harbor mouth. I was, of course, lost. I never once felt lost when crossing the Gulf of Mexico, or even making my way down the first part of a strange coast to Isla Mujeras. But now I was back in civilization, the maze of rules and regulations, of walls and fences. I knew I was in Isla Mujeras, and though I looked at my guidebooks, I had no idea where to land. I was really pretty worn out still, with a morning's beating by wind and rain behind me as well. But it wasn't confusion, it was the experiences of a lifetime travelling around the U.S.A. I was afraid to land anywhere, afraid someone would get upset or call the cops or get me in trouble somehow or try to steal my gear. I had to learn that I was out of America, and no one here would be so unkind. At worst they'd just ask me politely to move and even go out of their way to help me to a better spot. But For the moment I was left tacking up and down the waterfront, trying to get a good look and equate it with the map in my guidebook. I had finally given up on the idea of chancing a public landing and decided that tired as I was maybe a marina was the best option, though I had never actually done that in my life. The guidebook had given Marina Paraiso a good mention so I made another pass trying to figure out where it was. As I rounded about at the end of the harbor, a motor-skiff that had come out from some local docks came by; they waved and shouted a hello and where I was from. I thought, "why not ask” and called for them to hold up a minute and I rounded again and luffed up beside them. I casually answered that I'd just sailed in from Florida, had left 9 days ago, had spent the night at Is. Contoy, planned to clear into the country here. They just kept looking at each other as well. When they asked me what I was doing next, I said that actually I was just looking for a place to land, a little piece of beach anywhere, and if they knew where Marina Paraiso was, or anyplace I could just stop and rest while I got it figured out. It turned out that the person I was talking to was Manuel, the owner of Marina Paraiso. He had been there on the dock with his friend Juan Manuel, watching me sail by, and said, "look at that guy flying a Q flag, we've got to find out where he came from in that little boat! They jumped into a skiff and took off after me. Now he invited me to his Marina and said follow me in, which I did, and soon I had nosed up to a little bit of beach by the dock, and stepped back on land again. Though I anchorwed at Isla Contoy, I never touched shore, so I consider this the first landing. Passage completed. Tired as I was, I secured the boat before I rested. But before I did anything, I knelt in the sand a moment and offered up a word of thanks for a passage made. I'm not a religious man, though I am a spiritual, mystical one. I can't tell you what or who I was thanking, and I don't know that it really matters. No matter where and when a sailor goes to sea, they should give thanks that they return again, a thing that should never be taken for granted. Then I buckled down to securing the boat against storm and putting everything back in order, though I might have been moving a bit slowly. As I finished up, I was invited aboard the closest boat where a small impromptu party sort of developed in my honor. Seems word of my passage had gotten around and I was somewhat of a personage. They called me all sorts of things, in Spanish and English, and would reach out and touch me like something would rub off. 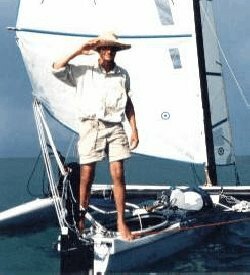 Everyone thought I was something of a sailor to bring a 16-foot boat across the gulf from Florida, though to this day I have a hard time thinking of it as such a big deal. Later Juan Manuel took me out to eat in town, and then fixed me up a bunk in his boat. I was getting pretty hazy, but I was so satisfied to be there and a bit being a "guest of honor", something I'd never experienced, and thus, more novel and amazing than the trip across the gulf, which was just another adventure in a life of adventures. I can't say enough good things about Manuel and his friends, the employees and guests at the Marina. After such a tough passage it was really like heaven. As Manuel said, he'd wanted a marina built by a sailor for sailors, and that's what it was, the first thing he did was to give me a key to the shower! I was made a special guest of the Marina, staying the whole time at no charge, in honor of the passage I made. He said he didn't want a sailor like me to stay anywhere else. . He told his employees to help me with the boat and helped arrange for repairs, and contact the boats owners, and made me feel welcome and honored in many different ways, even offering me the use of his kitchen. It was paradise at Paraiso. I can't recommend it enough to anyone stopping in Isla Mujeras, whether for the attitude of the owner and employees, or the really prime selection of cruisers who used it as their base whether in a slip or at anchor. Whether trading waypoints at "the palapas of knowledge" or relaxing in the gentle atmosphere of the place, it was one of the best experiences of the trip. Even with the frustrations entailed in staying 12 days for repairs: (6/16 to 6/27) and seeing my "short trip to Belize" slip away, intimations of the trip ahead. I spend 12 days in Isla Mujeras. Things for the most part worked out well, if slowly. I was treated great at Marina Paraiso, Manuel even letting me use his kitchen, and camp in the palapas. He hooked me up with a sailor on a boat offshore who also had shop in town with a TIG welder, to do the repairs. I was playing dulci at the Marina and all around town. I spent the two weeks there between (among other things) the repairs, waiting out bad weather, getting waypoints and detailed information on the coast from Skip and Pat of Star Watch, copying a set of local charts from Juan Manuel (which turned out to be essential). Finally, I was just waiting till Monday to clear out with the port captain. I spent some of the extra time giving rides to all the people who had helped me, and though the wind wasn't really strong enough, I was able to get everyone up on the foils at least once. I'd walk the mile to town to buy mangos and bananas, have bread and chocolate in my favorite café, rice and beans and tortillas down at the public market, and buy flan and pastry anywhere. Whenever I couldn't work on the boat, I played the dulcimer. I wandered the town, playing for anyone and everyone, in the cafes and markets and in the street. It was really fine, in those narrow cobbled streets not meant for cars, lined with small shops, the smells of coffee, chocolate, fresh bread and pastry mixing with fresh fruit and the crowded aromas from restaurants. Here it was no problem to sit and play wherever I happened to be. Soon people would see me coming and wave me over to play. They'd ask for "just one song” knowing if they got me started, I'd play for an hour at least! The mechanic who did the welding asked me to come down to the beach to meet his friends on his day off. I sailed down to the beach and played there, balancing the dulci atop the boat while people sat in the water around me, drinking cold pitchers of iced mango juice. I played for the other sailors under the dock palapas at Marina Paraiso, when we had a little party one night, and one couple produced a bunch of wooden percussion toys, and we really got stomping' a couple times! Made you wonder briefly how good a shape the dock beneath us was in. One day while walking into town, I stopped to admire a beautiful classic old boat, something like a lugger, pulled up to the beach. I ended up playing for a beach party being held by the German consulate. One really memorable night I played for a group of sailors gathered in the cabin of a 65' Deerfoot. Its hard to describe the incredibly beautiful, deep and magic moments that the dulcimer can create when the energy is right, like that night. On this trip, it happened again and again, a constant thread in the journey, each scene like beads on that thread. It felt like I was back in the life I'd lived for years, when this was all I did, wandering the country with the dulcimer, an American bard. 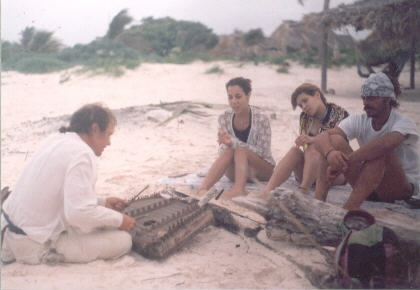 Now I was a vagabondi bard on the coast of the Maya, Quintana Roo. I head out in the afternoon after spending the morning copying the charts from Juan Manuel and clearing out with the Port Captain. I have a zarpe (cruising permit) for Xcalack, on the southern border, as I intend to run directly down there with just a few stops, none at major ports (to save time dealing with officials) and be down in Belize in just a few days. With luck, I can still keep to my planned schedule if I give up any exploring along the way, and just deliver the boat, get it stored, and head back to the states. Though it is late afternoon, I have started on my way just to get started, and be up early and moving in the morning, "on the road", an old habit of mine. I take the dogleg short cut out of the back corner of the harbor and am soon running south through a beautiful day of blue skies and puffy clouds. I arrange the new coastal charts in my map case and begin sailing with them in my lab, transferring their scale into a visual scale in front of me. I also made a set of waypoints taking me down the coast a good ways, where to turn and points to stay outside of. The tall hotels of Cancun and the winking reflections off cars were no attraction, just the opposite, I wanted to clear the point and leave that behind. It was rough and choppy going, no reef to absorb the waves and the two points reflecting the big waves coming out of the gulf, Those waves were a sign of the disturbed conditions that were already troubling the gulf and making themselves felt. It was to be a stormy summer. Between charts and the GPS for reassurance, I made my first run through a gap in the reef past Punta Nuzac. I was able to continue south inside the reef from then on, thought it was a tight squeeze at Punta Petempich, cutting over some shallow water between the reef and the point. Darkness was falling as I was still a few miles short of Puerto Morales, but I found what I wanted, a deserted stretch of beach between town and the last resort on the point. I was still leery of pulling up anywhere inhabited ( Later I would realize I would have been welcome, especially with the music). It is good after those two weeks in Isla Mujeras to find a deserted beach, with only the surf and the stars and the sea wind. I sit crosslegged in the sand, wrapped in my blanket, facing the sea, watching the moon rise, thinking about the life I've lived, how extraordinary and beautiful. I am here again, wondering why I don't have someone to share this lovely moon, reflected upon the sea. The moon rises into clouds as I sit, pondering the things I have had and the things I have not, the things I have lost on this road I have traveled, the things I have found. Later, just as it breaks free of the clouds, I can see the reflected moonlight begin bright upon the horizon, racing towards me down the water. The dark shadowed beach suddenly glows with light, and I stand, illuminated, and raising my arms I cry aloud to the Great Spirit "I am yours, use me as you will!" Then I walk back to my gear and sleep in the sand. The rave quietly bobs in the surf, anchored just off the beach. And the silent moon passes over us. I am back in my element, waking up to the sound and smell of the sea, the seabirds' cries and the sun rising over the water. There's a chill in the stiff breeze coming off the water, and it's building good surf as the tide is high. 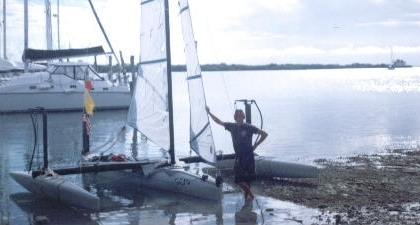 It is a difficult launch, very hard to break out against wind and wave, with no water depth to drop the foils, and not good control without them to sail to weather. I start my day soaked to the skin, but the sun is hot and fierce though the wind is cold, and Puerto Morales is a short run of a few miles down the shore. I stop there because one of the local senior sailors at the Marina had asked me to visit his friend there, the Port Captain. So I pull in and beach just North of the light. Now I have no problems with pulling up clear of any obvious landings and leaving the boat while I walk into town. I find the Port Captain, but he can't figure out whom I am talking about, and of course, my Spanish could be better. Perhaps he can't understand that I'm really not there on official business, just to fulfill a promise, but since there is a Port Captain here, I need a "puerto intermedios" added. It takes over an hour of waiting to get the little paragraph and signature on the back of my zarpe. I am troubled by the delay for nothing, but I stop at the square and check out a small two-table cafe. I'm surprised to find natural foods, whole wheat seed/nut bread, a rare commodity in Central America. So I buy a loaf, and eat it with a cup of chocolate. Bread and chocolate, an echo of Isla Mujeras, but it is the last taste for a long while. Though I eat quickly and get back to the boat and get underway. By 11 am I am clearing the entrance to the ship channel that extends to the south from the port. I proceed down the coast, setting approximate waypoints off the charts to use for reference. But I am using dead reckon primarily, now, with the chart laid out on my lap, keeping track of position and visual referents to the coast or the reefs as I continue down the coast. The journey has become a journey from one Point to the next, as they define the horizon ahead, since I can't see past them. Between the points I try to reconcile what I see on the coast with the chart, the curves of a cove or bay, minor points, and extensions of the reef. The GPS waypoints I enter in more for future reference, and it is handiest in telling me how many miles it is yet to farther points, like the next town, Playa Del Carmen. The development along the coast is obvious, a new resort built or being built, from small enclaves to mega-structures that remind me of prisons or dismal old science fiction sets of soulless cityscapes, all along the way. I take pictures of a cluster of bright pastel buildings that seem almost like something Middle Eastern, with walls and towers, domes and minarets. 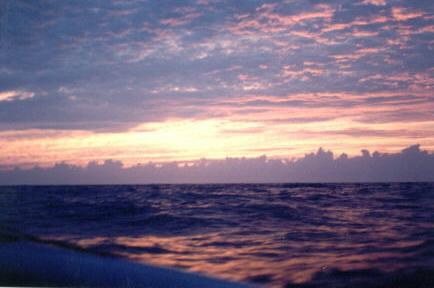 I reach Playa Del Carmen in a few hours good sailing, though the seas and skies have begun to build again. I sail back and forth along the beach, thinking of landing, examining the waterfront, a thankfully scaled-down version of American standard. Though conditions are deteriorating, I decide to continue on. I am moving fast, 6-8kts, and the time I had for exploring is gone. If I take more time, I want to do it once I am safely in Belize and the all the arrangements done for me to leave the boat and go. Before I get away a man on one of the rental beach cats comes racing out and alongside, talks to me a bit, admiring the boat, seems to know what it is. He turns back as I set course south, into approaching squalls massing in the southeast. Within an hour storms are moving in all around, with stronger winds and heavy breaking seas near broadside. I am moving fast, slicing off wave tops and leaping through the troughs. It is hard, cold, tough sailing. As I near Puerto Calica I look back am surprised to see a freighter behind me though I'm not 75 yards from shore. I realize he must be heading for the port. I am going fast, staying ahead, but storms are moving in fast. I don't want to hove to in the storm and have it overtake me. The coast is solid on-shore reef here, with no place to duck in and no protection from the open sea.. Though the wind and seas are building more as the storms approach, I decide I have to take a chance. I tighten sheets, and immediately jump to the foils and race away, gain a mile and more in a couple minutes, clearing the entrance of the port before I crash. As I look back, the freighter disappears, lost in the solid rain descending behind me. Luckily, the little sprint has also gotten me outside the edge of the storm, and I head on. I am racing through high wind and seas, trying to read the clusters of storms and weave through them, holding back or pushing it as necessary. I am either lucky or good at it, as I do well passing through the tail or racing across in front of the worst squalls. I pass Puerto Adventuras, pausing in front of the huge resort complex to make a waypoint. I think of sheltering here at the marina or the undeveloped lagoon they've supposedly cut an entrance into. But the openings are not obvious, and not recommended in bad conditions like I'm in. I am moving fast, 8 knots solid, and decide I can make Tullum probably, if I keep on. A major distance for a day's sail, even with the delay at Puerto Morales. I head on. The sun is getting low, but I will still make Tullum or near , when the starboard weld breaks with an audible snap. I let the sheets fly and wallow in the heavy seas. I climb out and lash the aka with rope again, quicker now that I have some practice I guess. But I don't have time to waste, and there is not much time left before dark with conditions deteriorating. I am moving again with the sheets loosened to ease stress on the boat, though reducing my speed, I am balancing to balance progress w/ survival. The right aka is submerging most of the time, not good. I look at the chart for somewhere to seek shelter, Xel-Ha shows an entrance into a lagoon and a lighthouse on the point. All other entrances are vague and unmarked, Xel-ha is further but sure shelter on a rocky coast. I go for it, hoping the boat will hold together even in these conditions. Storms closing in again. I keep on. 1830 : 20 20 369 X 87 20 330 It's getting dark in rain and storm, though I gamble I have more time since the dusk is early due to the storm. I mark this waypoint to measure how far I have left to the waypoint I've chosen just off Xel-ha. With but a couple miles to go I decide to keep on. The light at Xel-ha should be visible soon, just past the next point, and guide me in. I am almost there. 20 19 000 X 87 21 000 : Xel-Ha I am before the opening, it must be Xel-ha, and the lighthouse is a short structure on the north side of the entrance. There are huge breakers on the on-shore reef, and just one narrow opening between low cliffs into a passage leading in, full of foam and breakers. I have no idea of depth, but the chart marks it as enterable. It is almost fully dark, a nightmare image of black water and white foam and spray, thundering breakers exploding on the reef and the cliffs, and boiling clouds racing low and furious, barely visible. I have little choice, the opening must be there. I head in, knowing I have only one chance. I come in on one breaker, almost slip but recovering balance before I'm picked up and buried in the next, taking on gallons of water but carried in through the opening and clear. I fly in under full sail downwind, hurtling down the narrow channel between low cliffs white with breakers and find an unmarked floating bridge across the entrance to the lagoon, just before the passage opens out again, maybe 75 yards in. I turn just in time and come to shore in the corner of cliff and bridge, hard coral cliff and rock, the water is heaving with the swells forced up the channel. I leap into the dark water, struggle to keep the boat off rocks and bridge, get the anchor ashore and wrapped around a post supporting a gazebo above the bridge, a second line back to the bridge to hold it away from the rocks. A lone watchman appears, and I start to explain, then apologize, and leap back in the water, go back to securing the boat. 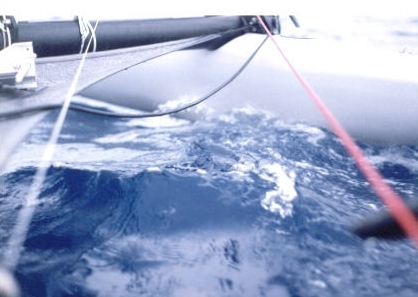 It is surging and twisting in wind and wave, I need to drop the main and jib. More security people arrive, I'm trying to explain and they are too, difficult, but essentially they are saying I can't leave the boat where it is. I can see it must be some place official. The storm is really working up now, the wind rising to a howl, even more intense now that I am not part of it, feeling the wind howling in the rocks and feeling the ground shake with the pounding of the seas at the entrance. I am too tired to deal with negotiations, so I raise the jib, cast off, and manage somehow to get out of that corner. I sail out into the cut, work upwind with the sail and paddle enough to drop the anchor in a patch of sand, and let out all scope till I'm just ahead of the bridge. I bail and try to straighten the mess, eat some granola and protein powder. I finish, and finally am just sitting in the boat, pretty tired and giving thanks for making it. I am just looking out in tired amazement at the fury of storm and sea exploding on the rocks, not that far away directly ahead of me, white and black, rain and spray mixed. The lone watch flashes a light at me twice, and I have no idea what he wants and don't really care, but I respond with two flashes as well. I am soaking wet, but I curl up inside the boat with my blanket over me and sleep. In the morning, I noticed that half of the bridge behind me had been washed away overnight. The Mexican coast guard came out and inspected me. I think they were certifying that, yes, the boat was broken and yes, it looked like I had sought the nearest safe harbor in an emergency. The result seemed to be that I was in the clear, officially. I swam in to shore, and the director of the park asked me not to leave, please. There was no problem with me staying, and the cut was too dangerous until the weather subsided, maybe in four days. I was welcome in the park as a special guest, to sleep in the hammocks, and make myself at home. When I offered to play for the staff, he asked me to please play for the visitors as an official performer. I floated the dulci in on my sleeping pad and spent four days in Xel-Ha, playing during the day, and sleeping in the hammocks if it was nice or under the big palapas (a palm thatched wall-less building) when it stormed, which it did a lot. It was a beautiful place, the lagoon, and the casual yet high-class facilities, with sound of live marimba players drifting through the palm-shaded deck chairs and hammocks. One of my friends their commented that even though my boat had broken, I was lucky enough to get trapped in a paradise. The high point was playing music for the dolphins in the dolphin program. I got right down on the water to play and they loved it, rearing up to focus their sonar on the dulci. Later, they just floated motionless under the water in front of me, like spellbound children, holding their breath as long as they could before swimming off to breathe, but coming back again as long as I played. I did it twice, and the trainers were delighted, and invited me to return and swim with the dolphins after the shows, which I did. Finally, there was a little break in the weather, enough to make it possible, if not exactly easy, to leave. The dolphin trainers had been reporting the situation from the satellite images they got at home and said I had a day or two at best before a new tropical wave came in. I climbed out onto the rocks of the entrance and planned my exact route. I had to be right on, and spent a few tricky moments going out against the wind and wave. I had to come about a scant yard from cliffs as I tacked up, finally tacking out through the surf that was pounding on the coral rock only a couple yards from the starboard aka on the final tack that took me clear. At this point, neither GPS unit is working, so any included waypoints are from the list I got from Skip, not from actual readings of my own, and are included only for reference. I cannot gauge speed either. I am forced to rely on dead reckoning alone using the detailed coastal charts I xeroxed out of Juan Manuel's guidebook back in Isla Mujeras. May the Force be with me! 1330 : Arrive at Tullum, enter the reef through the Maya Cut, North of Tullum . It was a short sail to Tullum though, the town I was headed for when the weld broke. Tullum is the site of the biggest Mayan ruin on the coast, the center of their seafaring fleet that once numbered around four thousand ocean going canoes. I saw it resolve out of the seacoast haze of wind-borne spray, a large fort right on the sea cliffs, marking a narrow entrance through the reef. Coming into Xel-Ha the chart case had leaked, and since I was running for Tullum at the time, its page was on top. When I removed the page, the xerox ink had transferred to the inside of the clear plastic map case, and that imprint was the chart I used to guide myself into Tullum. Both GPS units had given up the ghost, so I came in through the Maya cut on compass, and using the ranges built into the structure of the fort. I felt myself truly following in the track of the Mayan canoes then, a great moment. After again running up and down the beach to get a better look, I beached the boat just South of where the cliffs the ruins are built on end on the main beach. I get right to work, and after the boat is emptied of gear, some of the folks on the beach help me drag it up above the high-water mark. Before I finish for the day, I have the starboard aka disassembled and ready to take somewhere to be repaired. I spent a week getting the repairs done and waiting for a new weather window. The weather had deteriorated for sure while I was stuck in Isla Mujeras. It is strange to think that what amounted to a four day sail took me weeks between weather and repairs. Tullum was a strange place. I liked the town, inland a few miles, and the ruins were deep, though overrun by tourists. The beach was cool, with mostly backpackers and hostelers at the camping end of the beach where I was, all young on their great adventure in Mexico, all reading from the same guidebook. But since Tullum was part of the circuit of ruins, not the resort beaches, there were more travelers than tourists there. But the places and people in the area behind the beach were too often distinctly unnerving, if not downright hostile, resentful or predatory. There was a family of kind folks camped where I had beached who had a car and gave me rides to town. Both photographers, she was Mexican and he was American, down with their two kids to explore her old stomping grounds. Then one rainy day they took me all the way up the coast to Playa Del Carmen, where I had the part re-welded, this time inside and out. While I waited I played in the shops in the tourist area. After I got the part, I met up with the folks and joined them at a nearby club/restaurant. She was thrilled because she'd actually finally run into a group of her old friends there in Playa Del Carmen, which made me feel happy that the trip turned out to be a good one for them. She'd been hoping to meet some of her old friends but hadn't had any luck. It seems a bunch of them had ended up in Playa Del Carmen, the boomtown of the coast there. It was funny. They asked the manager to turn down the music so I could play for their friends. He not only turned off the music, but also went up on the bandstand and got a couple mikes and set me up right at the table, kicked in the PA, and said "go for it." I did. He said come back if I want a job, something that was called to me several times as we headed for the car from other shops I'd played at. 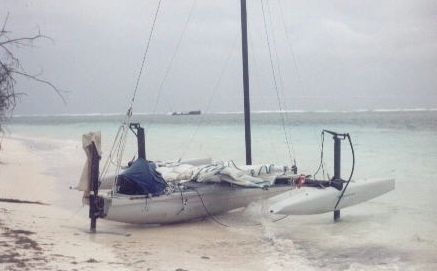 The next day the boat was together and launched, but the weather was bad and deteriorating. I took the people who had helped me at various times sailing for the short trip down to the ruins, to see it from the water, for the final couple days while I waited for the weather to stabilize. Its was also a troubled time there. While I played all around, and had a few good people to hang out with. There was the underlying instability of the local scene, where everyone was drifting through. Yet I always connect deeply, it is my nature. It was also troubling my heart. Once more I was surrounded by young girls, at least adventurous enough to have come this far. And there was a good bit of the resort vacation pickup scene going on, though I wasn't interested really, I can't deny that it tempted me. I am a lonely man, and as hungry as any. At the same time, I wanted more, and somehow the depth and energy of the adventure I was on made something so insignificant seem inappropriate. I realized that I wanted someone to share this adventure, and at the same time realizing that this adventure was just beyond the reach of all these girls. They might be here on their great adventure in Mexico, but I come out of the sea on my little boat to where they have come down to the beach from their hostels and campgrounds. They have reached their outer limits, while I am coming out of something far beyond that to encounter them. I could see them suddenly aware at how much further real adventure goes, and perhaps unconsciously recognizing that it is beyond them, they would laugh and turn away. I guess I got almost confident in that, a little bitterly amused, a little crazy, and asked half the girls on the beach of they wanted to go with me, about as uncharacteristic for me as I can imagine. But of course, none of them said they wanted to go, my adventure was much too serious and real for them. And later, as I sailed away, I realized they were right. They wouldn't enjoy it. They are just out for fun, and real adventures like mine aren't fun. They are too hard and harsh, too awesome in beauty, to be "just fun." They are intense, unforgettable, inspiring, and humbling; but fun is found occasionally, a fitting balance to the moments of absolute fear. I met a nice girl, too, one I could relate to, though of course nothing ever came of it, of course. She went her way and I mine; but she was nice to talk to for those few hours we crossed paths, a story I know so well I expect it now. I noticed her first because she was drawing pictures in the sand, then one of the guys called me over to play for her and her girlfriend, and somehow it was one of those magic moments when the music comes right. Then I went off and played for other folks around the place, but later we ended up talking again at the bar and grill palapas behind the beach as I played some more. The next day I got up and did my routine. Drawing a picture in the sand for the waves to wash away, a symbol drawing and image, sorry no graphics here. Then I did my kata facing the risen sun. Then went in for a morning swim. As I returned from the sea, I see a beautiful sight, just down the beach is a girl, and she's doing the first yoga kata that I'd learned years ago, "salute to the sun", and then she too goes out to swim. I decide I have get over my normal reluctance to bother people to meet this girl, and guess what, its the same girl again. And turns out she's a theater person (like my ma), stage theater, Shakespeare; enough to have the masks tattooed on her back. And we spend a couple hours talking about theater and performing and music and art and energy and the life of an artist. But then its time for her to go back to Cancun to work, and though she says she'll be back next weekend, I know I won't be there, and though I suppose I'd have waited if I could, its really more dream than reality. I upped sail and left the next morning, with a troubled heart. Perhaps it was not so much just over her, or maybe because of what she was rather than who she was specifically, because of the whole experience in Tullum. Was it recognizing how unlikely it was I would ever find a companion unless I would "settle" down and live a normal life, like everyones tells me? While recognizing how unlikely it is that I will do that. Perhaps it was living through a scene I have known too well, if not often; where I meet a special girl, yet my life is on such a strange and unique path that our lives can only cross, never to meet again. Perhaps it is other places and moments of hope and dissappointment in my life, just echoing. It all tangled into a strange mess in my heart, as I left that place behind and headed away once again, back to the wildness and intensity of my life and nature, heading out into the world I know so well. No one is around in the morning, somehow it is appropriate. I am alone. My few new friends have all packed up and gone over the last couple days, the energy is moving. I launch the boat by myself in bad surf, but there's not enough rode to draw myself clear of the breakers. As I struggle to raise the sails, the boat is swept by waves and almost for the first time, a frightening experience, close to real trouble. I lose the top baton from the sail and spend an hour or more looking for it, in the sand of the beach and diving with the mask offshore. No luck. The barometer/watch has also been lost, too, swept right out of my pocket, torn loose from its lanyard, though I do not notice for many hours and miles away. With the wind steady from the northeast, I sail south inside the reef till it disappears. Though rough and wet, though choppy seas, getting soaking with spray; it is good sailing under bright blue skies and scattered clouds. I hug shore till the reef re-appears, finally heading outside through the reef at Punta Yu Yum by taking a bearing on the bridge at Ria Boca Paila. I stay outside, passing Punta Xamach. When a squall line moves in, I head in for a small village on the chart, sheltered by a point, Casa Blanca. I don't land, just get close enough to do so if I have to, then I wait while it rolls in. It passes with out a local storm, and I turn back out to round the reef and head south. I end up cutting in too soon, and thread a passage between the outer reef and the inner reef. It is a narrow gap that I thread through slowly, luffing the mainsail to slow myself down as needed. The tiller I have made for the rudder proves itself to be an essential improvement to the boat to let me stand and see down into the water, impossible from the vantagepoint in the cockpit, less than a few feet above the water. I run direct South on compass, veering away from the reef to avoid patch reefs near Punta Allen, making for the main opening in the reef into Bahai de la Ascension. The strong counter current is obvious as I move into the blue water. Later I notice an obvious line of foam marking the boundary between the strong northern current and the narrow counter-current along the reef, in the greener water over the shallows (under 50 feet). Though shore is barely visible far back in the bay, the reef is obvious when I come back to it, a line of breakers in the open water, and I follow it closely till I come to the opening. The weather is deteriorating again as afternoon storms begin moving in. I head in for the Calubra Cays inside Bahai de la Ascencion. I don't want to loose time by sailing in for the passage into the inner bay at the north end of the Cays, but slant towards them while I continue south inside the reef now, trusting I can cross the shallow water and run straight in if it looks bad. I reach the end of the Calubra Cays and decide to make for Punta Pajaros at the southern point of the bay. The water is very shallow, 4-6'. Again, I stand and use the tiller to avoid shallows. It is actually some of the sailing I enjoy most, standing and sailing across the calm inner waters of the bay. Perhaps too it reminds me of my old sailing kayak, Horse, so similar to Further as I stand on the narrow kayak-like center hull and fly along. Though Further, a trimarran, is like a dream of stability compared to Horse! But once again I am sailing standing on a narrow hull, racing across the water with little but the sail and the water under my feet. I beach at Punta Pajaros and camp. The lodge there is closed for off-season w/ just a few students there doing turtle counts. One of them is on the dock as I come in and waves. Then meets me where I beach a ways away, tells me there's no problem with me camping with the place closed. We talk a while, kindred spirits, of the beauty of the natural world, the "pura vida" and elemental energies here. Of his dreams to get a small boat, and pursue some sort of career after school that will keep him out in places like this. Later, though I am tired, I pull out the dulcimer and play out on the concrete docks for him and a couple other students. Then they go off into the night in search of turtles and I go to get some rest. In the night a big storm finally hits, but I am wrapped in my tarp and snug. Somehow there is nothing so comfortable as that, and I sleep soundly as the storm rages over me. In the morning a shirt I hung up to dry is gone. I find it a quarter mile down the beach. I pack quickly and shove off soon after sunrise, though the clouds are already building and the wind dropping. The delays at Isla Mujeras and Tullum for repairs have pushed deep into the summer storm season. I try not to think of dealing with a hurricane on this low, exposed coast, with the reef feeling like an insubstantial protection for something that powerful. I exit through reef immediately and run for Bahai del Espiritu Santo down the outside. Good sailing with steady wind and light chop, a big but smooth ground swell. It is some really pleasant sailing. Reaching Tupac, I decide against trying some small entrance and head out for the main entrance, though conditions are deteriorating and it takes me far from shore. The wind is dropping now as I enter the bay, not rising; it's not a good sign. But I am still sailing well, enjoying standing again in the protected waters behind the reef. These bays could be a great place to spend time someday, but now I head south for Punta Herrero. Conditions are deteriorating, storms moving in from offshore with solid rain. I decide to weather the point and try to run and outflank them. It is still early. The wind almost dies as I come to round the point, but I head on, as the storms are moving NW, and my course will be southeast as soon as I turn. I make it round the point, running with the increasing wind. I think I have avoided the storm. No such luck, this is an intense storm front and extends well beyond the core squall. I am suddenly hammered by some by serious wind. Though I am behind the reef, in the narrow pass between it and shore I am too near the reef to turn up towards it and the wind and have time to drop the sails, so I have to run in to shore. I almost pitchpole again trying to come about. But I am able to drop the main and come back in to shore near some Mexican fishermen who have done the same. We wait as the rain pours down and the wind blows over. When the storm passes we both continue, they north and I south. I continue inside the reef, not wishing to go outside in the mass of storms. The way is narrow but clear. I am close to reaching the small bay at Mosquitero, with another storm moving in. I am flying, planning to round the point and beach in at the bay. But the pass is blocked by a set of fish fences. 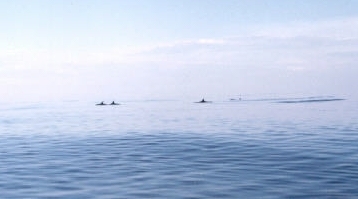 They extend off from shore and out into the water, barely showing, and still extending only part way out into the pass. I don't realize that the coral extends toward shore there and the fences are using it, blocking the narrow lead along shore. I am forced to pull up but immediately run into coral, lucky I am hardly moving when I do. I am able to drop the sails, raise the foils and push off, but the wind is much too strong to go against and I can't raise sail again, so I squeeze around the end of the fence, bumping and scraping. I pass by the fish camp and beach at the base of the second fence as the storm hits. One of the rudder's sheer pins is gone, I have only one spare to replace it with, and I do, a bit disappointed that there aren't more in the gear. As the storm pounds down I shelter in the lee of a boarded up house, and eat a mango I had stashed away for a treat. When the squall passes, I prepare to walk the boat around the second fence at low tide. The wind is too strong to paddle against and I could never sail in the maze of coral heads. I turn back just as I've started, when I see a Mexican motor-skiff coming up from the south to round the fence, to give the room to come in. I think maybe they know a way around, but they have to bump and scrape and curse to get around themselves. I start out, and they come over to help after beaching their boat, then go back and get it, using the motor skiff to pull me out against the wind. As soon as we clear the fence I cast off to let them maneuver and I paddle downwind back to shore. They tell me the fence is a bad thing, and as well that there is no way through the reef across the bay, I have to go outside through the entrance to the bay. I thank then, raise sails and head on in bad weather. I tie in one reef in at first, then am able to shake it out, or maybe it's just that the sail doesn't reef well, and I'm better off luffing. I make for the next shelter, Santa Anita, as the day wanes and the weather isn't looking to improve. I clear the end of the reef there and turn back into the bay to work my way back behind the reef, ending up in a narrow lead along shore the shore, to beach on the point, by a line of dead trees along the beach front. A bit further north, there is the wreck of a freighter high on the shallows behind the reef, a silent monument to the power of sea and storm, sobering as the evening falls. I manage a fire even in the wind and have a hot meal. I watch the flames. A lone man walks up the beach late, and confirms that I am near Santa Anita, though he calls the place we are by the more general name, "Tampalam" There is a bad storm at night and for the first time, my camp is destroyed and everything is soaked. In the night another storm came in and for the first time my camp fell apart and everything got soaked. It was actually so hot and still at first that I'd thrown the plastic back to get more air. I was under the mosquito net and didn't wake up even though it was pouring rain as the net stopped it. But I woke up soon enough as the water flooded in, puddling in the ground tarp beneath me. The wind hit, too, and I grabbed the wrong corner of the tarp cover so nothing mated up right. In the torrential downpour, everything got soaked in just the few minutes before I could get it straightened out. In the morning it was dead calm. I walked down the beach and to the bay, and suddenly there were all these fisherman/divers on the beach, arriving for the beginning of lobster season. The wind came up a bit, so I went back and upped sail. I headed out across the bay, but there was a storm front moving in that was no little local thunderstorm. I turned back. By which time the wind had died, and I started paddling, talking to the lobster divers who were also heading in. I looked over my shoulder at the approaching storm, stopped, dropped the main, braced myself and paddled faster. Then it hit, a wall of wind and water that picked Further up and flung her even with just the jib up. I came screaming back into the place I'd camped before, getting totally soaked as I got the jib down and everything lashed and secure, protected by the reef and shallows. The wind just kept building to a full gale as I huddled in the lee of a fallen tree's roots, wrapped in my tarp, with the temperature dropping and the wind starting to scream. To make matters worse, the sick feeling I'd felt coming on the night before had developed now into a high fever. After a couple hours of this I roused myself to get moving, knowing I needed food and better shelter, knowing it would be tough. I couldn't get the tarp up at all, the wind was just too strong, driving the rain and spray hard enough to hurt exposed skin. I went a short ways inland and found a fairly dry spot behind a grove of small coconuts. The wind was blowing so hard that the rain was horizontal and left a small dry "shadow” in the lee of the clustered trunks. I spent an hour carefully peeling and splitting sticks for dry wood to make a fire. But I found my matches soaked and useless, the zip-lock bags failed totally at keeping out water, every one. So I walked down the beach, substituting movement for a fire, looking for a coconut at least. As I passed the homestead where the fishermen had returned to, the owner, Rudolfo, waved me to come in. He gave me coffee, beans, and tortillas while the storm poured down, and I did my best to talk through the fog I was in. He told me not to camp on the beach, instead he invited me to stay in a spare shack and hammock. So I went back to the boat and got my blanket and mosquito net, and the dulcimer. We sat in the tin roofed open kitchen shack, the open-hearth fire smoking away, drinking tea while I played. The storm howled all day and the rain poured down. Later, when the other guys all left and went to town, Rudolfo and I settled down and slept. In the morning the sky was still overcast, but I packed up and headed for the boat, promising to return for breakfast. Which I did, fried fish and tortillas, just as the storm broke again and poured. When that passed, it looked like it might be breaking up again. I gave Rudolfo all the coffee I'd brought with me, I'd stopped drinking it during the passage across the gulf, and bid him farewell. By the time I had raised the sails, the wind had died again. But determination is where I'm at, perseverance. I knew if I could round the point, a mere five miles, I could come back inside the reef again and be able to keep working my way further down the coast, even just hops between storms. I paddled for five hours in light winds almost dead out of the direction I wanted to go, South. But eventually I rounded the point and got inside through a small cut. Of course, at this point the wind picked up. I started to run south inside the reef, but was quickly hemmed in by rock bottomed shallows ashore and coral reaching out from the reef. I squeaked through, but saw the same ahead, and the deep water I was in heading out through a break in the reef, so out I went. I ran outside all day, along a dark and a featureless coast of mangrove. I was making for the only town on the coast, Mayugual, for food. I was down to using up the last bag of granola I'd saved for emergencies, and glad I'd saved it. It was a good run down the coast, actually, though the seas left over from the storm were something to see, but I'd had big seas coming in from offshore the whole trip. Outside the reef near Rio Indios I run afoul of a drift net just below the surface. Real trouble for a few minutes with the strong wind, and getting more tangled every moment. I run out and get the net off the outer foil, but the net has already fouled the rudder. I am afraid it will tear off, and I jump to release it. When I do, Further takes off like a shot with me still waist deep in the water, standing on the rudder! It's a few hairy minutes while I manage to turn the rudder and bring us into the wind, even with me dragging off the stern. Less than an hour to sunset, and I am clearing Punta Rio Indios. But I don't want to risk trying to cross the reef into Majagual after dark if it's further than I think, am not totally sure of my position. I choose prudence and turn back, going into a shallow opening in the reef straight out from a lodge with a small beach in a coast that is mostly solid mangrove. I didn't want to risk the town being farther than I thought and being trapped outside the reef in the dark, or even trying to run a difficult passage with the sun in my eyes and reflecting off the water obscuring everything. It was still a difficult entrance, with the water shelving to a few feet before I even passed the reef. I was coming in too fast for such shallow water and though the entrance was wide, anything might crop up. I was forced to tack back and forth in the entrance while getting the mainsail down to reduce speed and pulling the foils all the way up. I'd point across and do what I could before leaping back to swing us around and head back before we hit the reef at that side of the entrance, then do it again as we headed across to the other side. While doing this dance I slipped on the dropped mainsail and fell for the first time in the trip, clumsy with fever, probably. But I fell straight back onto the cockpit, bouncing back up to keep the boat steady in the opening while I furled the main. With everything up I came in through only a bare foot of water a short way behind the reef all the way to the resort beach. The small resort is closed, though the caretaker gives me permission to camp on the beach and shows me where I am on my chart, on Punta Indios but still a mile further south than I thought. I don't see him again to ask about food. I have no fire, and eat the last of my food, a cup of emergency ration granola. The resort is on a strip of high ground maybe 25 yards wide separating the sea from the mangrove swamp that stretches inland I don't know how far. The shallows are full of husky red crabs, some species that must like the brackish water here at the mouth of the river, which I know is only a little ways north. I spend a hard restless night with fever and sweats, the night full of the sounds of the swamp. Though I wake full of aches and pains from the fall and the fever, chilled in the dawn wind, still I gather up my gear and pack quickly. I headed out with the sun and wind rising together, wanting to get out before it rose too much and trapped me in that dismal spot. I made it outside, turned south, and soon sighted Mayugual. It was only a few miles further. The wind was fresh and steady, the sky fairly clear, and I looked at the chart. The last town in Mexico and my port of destination, Xcalak, was within reach. I still had 2 gallons of water, though no food left, no matches, and felt something washed up from the wreck. I went for it and kept on. I had a good run down the coast, though it was rough going, running outside the reef in heavy, confused seas. I was counting down the chart pages to my destination, eight times horizon to horizon, watching the weather for signs of danger, but it held with broken clouds and solid steady wind. The coast continued on in mostly unbroken stretches of dark, featureless mangroves. Then sometime in the early afternoon I noticed the bolts holding the right aka on have worked loose. I didn't have the right tools to get them tight enough back in Tullum. I stopped and bailed out the buildup of water to lighten the aka in heavy seas, . nervously watching the reef close to leeward. I can't risk trying to use the tools I have and lose them overboard in the rough seas. There is no opening in the reef nearby. I study the charts and decide Xcalak should be just over the horizon, so I press on, asking the ship to hold together. She does. I was right, and I sighted Xcalak right on schedule, my dead reckoning is now proved dependably accurate even on this unremarkable coast. Going from the guidebook and the charts, I ran the entrance that has a lot of the cruisers spooked, so many boats have wrecked on it. I had arrived at Xcalak at last, 0230, 18 16 20 X 87 49 30. With the weather deteriorating as I arrived again, I knew I'd made the right decision in keeping on. It turned out to be Saturday afternoon, and everything was closed for the weekend; except the navy, which inspected Further and checked my papers. So I went and had a chicken dinner at the little local place that was all that was open. The town is essentially shut down during the off-season. I was tired and still sick with virus that had started on me the day of the gale, but I unpacked a bit, kept on keeping on. 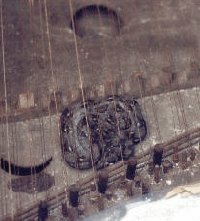 I was quite surprised to find a boa constrictor curled up on top of the dulcimer, wedged between the strings and the soundboard. The poor thing looked pretty seasick, lifted its head for a moment then keeled over again to hit the soundboard with an audible thunk. I tried to pull out the dulci quick so it wouldn't disappear into the bowels of the boat (after I took a picture), but it just as quickly slid inside the dulcimer to hide. So I put the dulci out by some brush, knowing it would certainly leave that night, which it did. After this I decided enough was enough, I was here and there was no hurry at this point, nothing official is open till Monday. So I lay down on the plastic to rest and gather strength. The fever was still bothering me, and even after a meal, I was pretty wrung out and weak from the past few days. I had only lain down a few minutes when a guy came down the beach to look at Further, a not uncommon thing. So after a moment I levered myself up and gave him the run down on the boat. He owned a local restaurant and dive shop, and was dreaming about something just like this, but was not just dreaming. He'd already modified a canoe to take a dagger-board and a windsurfer sail. But he invited me to stay in the closed restaurant and share the kitchen with him and his partner/relatives next door, so I moved Further down the beach to his place ( about 100 feet) and unloaded. They were cooking up the day's fish, so I ate again and didn't move much, but we talked a lot. . Everyone left early though, and I gratefully collapsed in my hammock, strung up between two pillars in the restaurant. The next day, I took a bath at the well, did my laundry, and cleaned the kitchen, did the dishes. It was way of saying thanks, and a gentle way to keep active while I was still feverish. I spent some time talking with Alexandros, and of course, brought the dulcimer in from its night in the brush, now minus one snake. Soon I had it tuned up and was playing again, in the house and in the street out front. The next day I cleared with the port captain and immigration, no problems. In the morning Alexandros said the guys wanted me to stop cleaning, I think because it was forcing them to straighten up by example. That day I made sopapillas from scratch and they were finished just as the guys got back from fishing. That evening I baked bread, which seemed to amaze everyone. The next day Alexandros said the guys had unanimously decided that he should convince me to stay. I think if I'd stayed another day and made flan and cookies they wouldn't have let me leave. Truth to tell, he asked me to come back during season; offering me a job cooking with him, and space to build boats on his beach-front for him and me. And I could play music around town as well after dinner. I am tempted, this could be the place I go to replace Florida. I'm definitely satisfied that I can relocate to the Quintana Roo coast, whether in one town or cruising the entire area, I'm not sure.. From Isla Mujeras to Xcalak, I've found plenty that I can be satisfied with. In the bigger picture, I am happy speaking Spanish and being in a Latin country, with flan and tortillas, and people who are relaxed and make me feel welcome. Where I can play music anywhere and people appreciate it and no one asks me to move along. Where I can pull up on the beach and camp, and no one comes to harass me. The following day I pull out. The Port Captain warned me yesterday that a new tropical wave was approaching the coast, but the morning was fair enough to give it a try. But I turn back ten miles along, when its time to shoot outside the reef and round the point. I choose the prudent decision with conditions worsening and heavy clouds moving in, the reef already near impassable in heavy surf and the coral near invisible in the dim light. A good sailor has to know when to turn back, when not to take a risk that can be avoided. I spend another night in Xcalak, this time being invited to a restaurant a bit out of town to play. After I do, I'm asked to come back the next night, and as long as I stay. But I have to say that I must be on my way. I am gone the next morning, shooting through the reef immediately this time, tacking out the narrow entrance and running outside through some of the roughest seas I've seen on the trip. Not the largest, though they were big, but it was a choppy mess with reflected waves from the reef and a deep trench just offshore combining to create huge rogues and gulfs, and breaking seas from four directions. Alexandros had warned me that it was a bad stretch of water. After a few punishing hours, I ran through a narrow cut in the reef marked by a small wrecked barge the locals in Xcalak told me about. I have been off my charts since I left Mexico, cruising unknown waters. 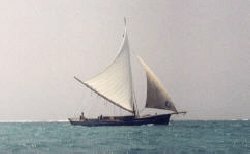 As I'm hove to, changing my flags to the Belize and the Q flag, a beautiful local traditional sailboat comes by under full sail, heading south inside the reef. I follow it down the coast into San Pedro, standing and sailing with the tiller to see better. It is a gorgeous sail with the brightly painted buildings of San Pedro shining in the sun, the old sloop laying out all sail like an old painting ahead of me on the sprkling water. I sail along standing up using the tiller, as much for pleasure since I am able to follow the sloop in. The trip is nearly complete. I cruised up and down the waterfront a few times, trying to figure out what was what, and managed to beach right at the police station/immigration office right on the beach. Customs came down to inspect the boat and all they could do was shake their heads and alternating unprintable adjectives with statements like "you're *** crazy! ", and kept on like that for almost ten minutes, while some of the local captains stood around grinning. One of them offered to let me keep my gear and sleep on board his boat. The local kids had gathered round, trying to climb on the boat, so I told them they had a choice, either clear off or work. And a couple of them agreed and helped me off-load my gear, and afterwards I let them sit in the cockpit and play on the trampoline. Later I took the main one who'd helped out with me a couple times when I went sailing. note: due to several logged days being half days or less, actual sailing time is closer to 16 days. I settled right in, playing for a good crowd in the street by the central plaza the very first night. Soon I had free space on a local dock and moved over there with my gear back on board, sleeping on Further at night. I played some places around town, invited to jam or play between sets by the local musicians. And I played anywhere around town on the streets that people asked and at night in the square. Business came first though, and I was dealing with trying to make arrangements to store the boat, so I could go. Though I found a new boatyard that had just opened that would store the boat, it was starting to look like getting official permission to do so from the Belizian government might actually be difficult. I spent hours at the local Internet café in contact with the owners, an arrangement that proved very effective really, though at times slow. 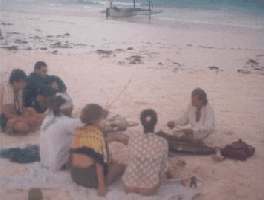 Some of the cruisers I'd met in Isla Mujeras showed up in town and said that more friends were anchored down at Caulker Cay and would like to see me. Everyone had been watching for me through the short-wave cruiser's net, and wondered where I was, even a bit worried. I'd been surprised that I never saw another boat on the way down except local fishermen. All in all I didn't enjoy San Pedro as much as other places. Perhaps it was partially that is was too loud right there where I had the boat. Perhaps I wasn't really ready for a tourist town after this long trip so often in the gentle beauty of nature. Though there were still plenty of local places, there was a feeling of being too much of a tourist trap, and too much of a place where the main tourist recreation was drinking. The slow replacement of the authentic and casual with the "upscale" and contrived. I've seen enough places like that and don't like them much. At the same time, the local folks were really good people, from the expatriate Americans to the born and bred locals. Though it was trying to be a party town, it wasn't nearly as bad as the real thing, it still had some heart and soul left, and wasn't all just sham and pretense. The artists were still real, and there were still people who just lived there, and fishermen. It also meant that they had definite improvements as well, like a good internet cafe. The reef was real, and the adventures were real, not just well packaged imitations like up in the States. It lacked the aura of falseness, rip-offs, and sheer decrepit, preditory debauchery that characterizes places like Key West. Of course, I was also there during off season, perhaps it was my luck. I've made a short run down to Cay Caulker to catch up with cruiser friends and take a break from the noise of San Pedro. 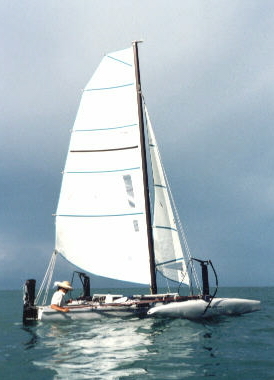 It's a clear run in fine conditions, "candy sailing". I arrive at Cay Caulker, come in to dock on west side, and check out the town. I meet Skip and Pat as they come ashore and we go talk, then I paddle out to anchor astern of "Starwatch". They are my hosts for the couple days I spend there, graciously offering me the use of their cockpit so I didn't have to rig the storm cover on "Further". And the dulci was out as well and we had a nice little get together on their boat. They and the other cruisers there gave me a lot of important tips on where and who and how to go about storing the boat, as I was coming to realize that Belize might be impossible. Still, it took nearly two weeks to reach the final decision with the owners to backtrack to Mexico and try there first, before continuing on to Guatemala and the Rio Dulci, rather than pay the ridiculously steep fees to leave Further in Belize. It is prohibitively expensive to leave a boat anywhere in Belize due to the government duties, 50% of the boat's value. Whereas in Mexico it is a $20 onetime fee for a permit and $30 a year in Guatemala. 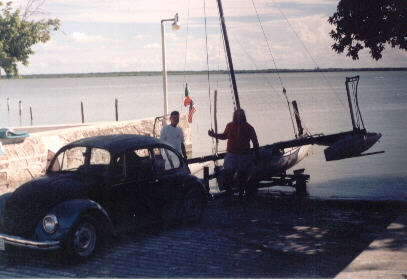 Lucky, I had made that trip down to Caulker Cay, where my friends gave me the name of a cruiser in Chetumal to contact, who proved to be a godsend. First, though, I would try Xcalak. I can also thank them for refusing to take too much time for business and dragging me off to the reef to free-dive. I love being in the water, but I'd felt so pressed for time on the trip as all the repairs and problems storing the boat, that I'd never taken the time to go over the side the whole trip. I'm just too responsible, and was still hoping I might make my deadline for the Alaska festivals at least. Thanks to them, I got at least a few hours in the water. I leave early, since I'd planned to leave yesterday but the weather deteriorated. I'm around the halfway point when the wind dies as storms begin to move in. I struggle to get closer to the shore of Ambergriss Key in case I need to seek shelter. It is slow, then the squall line hits and I race up the last mile to San Pedro in minutes, trying to keep it together long enough to get there. I'm counting the seconds till I'm there and drop the main to come in to Fido's dock. and tie up letting the front come through. I remain in port 6 more days finalizing the conclusion that I can't leave the boat there in Belize. The decision is to return to Mexico first and try Xcalak, then Chetumal, before I head for Guatemala and the Rio Dulci as a last resort. I try to get out and foil, but the boat refused to come up most of the time, but I manage one good run for three days of trying. I'm sure it is the one bad foil that keeps the boat down, and frankly, almost, but not quite enough wind. Its just enough resistance to keep the boat from attaining lift-speed without some major wind. I clear Immigrations and Customs, then head out in lightest breeze. Takes an hour just to get outside the reef. But I'm satisfied to be on my way at last. Light breezes all day, I catnap and drift north, edging out to where the current helps me along instead of hugging the reef to avoid it. I reach Rocky point in the evening. I just clear the point and look for a way in before dark. I raise the foils and come in over the reef in a low spot, not even a true opening It's only possible with the calm conditions and a curve in the reef breaking the ground swell waves, still 2' high, and being able to come in directly downwind with everything up, and I still scrape a time or two. I sail on through shallows, then drop the foils as the water deepens and sail on through dusk. I reach Boca Bacalar Chica after dark and the beach proves unappetizing with rotten seaweed and swarming mosquitoes. So I get back off as quick as I can and sail out to the reef. Even in the twilight I can hear the reef ahead and still barely distinguish the white of sand patches beneath me. I get close to the reef as I dare and drop the anchor in a sand patch. The light at Xcalak visible when I stand up. I have a good night's sleep for the first time in weeks, there in the quiet behind the reef. I am at home there, and rest easy, the sky full of stars. As I drift off I watch lightning playing in a few storms far to the north, but my night is undisturbed, and when I wake briefly at midnight, I only gaze in peaceful contented wonder at the so brilliant stars. At sunrise I am up and raising sail. In an hour I pull into Xcalak to clear into Mexico and get my cruising permit for Chetumal. I checked around in Xcalak, but no one was interested in being responsible for Further... I played the dulci that day down at the fruit vendor's shack in town, as well, with a crowd of village kids as my audience. Later, I made sopapillas at Alexandros's place again. Then I played at the restaurant out of town again that night. I headed south out of Xcalak to try and make for a narrow channel, the Boca Bacalar Chica, which the Maya had cut through a narrow spot in Ambergris Key into Chetumal Bay. The locals were split in their opinion as to whether it was possible for Further to make it through, but I figured it was worth a try. I made it to the entrance just as a(nother!) storm blew in, but I doused the main and drove in fast under the jib. It actually worked well, even with the rain, because the strong wind funneled up the twisting channel, letting me sail a good ways inland before it finally died, whether because I came too far inland or the storm just passed. Then I was paddling up a narrow channel against a stiff current, with the jib still up and slack. I used my canoeing skills to climb up through the eddies behind the curves, and ferry across the current to cross from eddy to eddy. I came to the final cut, only a few feet wider than the boat, with tall mangroves almost meeting overhead and swarms of mosquitoes in the still air. I made it halfway before I was hopelessly hung up, unable to maneuver against the current in such a small place with the current now even stronger and no curves in the channel. But I didn't give up. I took down the upper shrouds (wires that support the mast) that were causing the worst trouble hanging up in the mangroves, letting the lower shrouds support the mast. Then into the water I went, dragging Further up the channel ala "African Queen". Luckily, this water was salt and clear and better than being eaten alive, though almost too deep for me to walk in while the current was almost too hard to walk against. Another 50 yards took me through the cut, and as I broke out into the open a breeze immediately caught the still hanging jib. I scrambled aboard as the boat swept over me and managed to get to the rudder and keep us going down the channel. We were through! I sailed on a few miles across a bay before deciding there were no more narrows, we'd made it indeed. I could see an opening leading to big water to the southeast, so I anchored and reconnected the shrouds standing in the few feet of water around the boat. I raised the main, and peeled out. It was a bit nerve wracking to move so fast under the main in such shallow water, only waist deep, with a boat hard to control with the rudder foils almost all the way up. Finally, I rounded the point, skipped over a sandbar, and sailed free into the open water of Chetumal Bay. With open water to the west and the further shore out of sight, I headed North following the eastern shore at a good clip, localized storms scattered all around me. I decided to follow the curve of the eastern shore around to Chetumal rather than strike out into the open water for Rocky Point light with the weather chancy and no reference points. I would not want to have to chance the technical difficulties if a storm forced me to seek shelter and the option was landing in what would be Belize on the far side of the bay. Better to stay by the Mexican shore in case of need, and as important, it kept me in the lee of the land as well. By afternoon, the wind had suddenly died and I was lolling across the bay, now moving west following the curve of the shoreline. The water is turbid now, and the bottom seems fairly bare through 15' of water. Thunderstorms are still moving all around me. Just when I decide to lay back and try to nap, I am rudely disturbed by a Lear jet swooping down past me, only 100' or less off the water. Later I am told it was probably the DEA checking on me, but whoever it was, they didn't need to get so close. I was too upset to relax, and spent a couple hours contemplating whether power makes people into arrogant, inconsiderate jerks, while small sailboats make people more sensitive, aware, and conscious of their place within weaker and more powerful forces, balanced among them? Perhaps is it more a winnowing process, where power attracts bullies and things that require skill and ability instead of power attract the people with real character. Sunset came in a glorious display, with more types of cloud formations than I'd ever seen in one sky. In the northwest were the desert skies I'd seen in my western travels, while I could see the clouds created by high mountains to the west and south, and in the foreground, the sea clouds coming ashore mixed with local thunderheads, complete with rain and lightning. As the sun set, the wind rose. I managed to make the point opposite Chetumal, Punta Calentura, and round it in the dark, feeling my way in under the jib and paddle, to anchor close in the lee and watch the lightning play all around me. I was able to see (and take a compass bearing on) the lighthouse at Chetumal clear across the bay, when it wasn't obscured by a storm. Luck was with me and I slept deep on deck all night without a storm coming close enough to hit me. I raised sail at sunrise and headed across the bay suddenly populous with local fishing boats. A local boat was anchored and running a net in the shallow water near me when I got up. I remember thinking at one point that this might actually be the last passage, my last day to sail this boat, the end of the journey at last. Appropriately enough, within a mile of Chetumal, I was pounded by a storm that registered over 40 knots at the docks. I nearly pitchpoled again trying to come about and drop the main just before it hit, but I'm almost used to it now and handled it more like a pirouette instead. Then I dropped the main and fought it out with the jib till the squall line passed, then continued on under the jib alone, taking it easy. My friends had told me there was a floating dredge pipe across the entrance, but I wasn't sure when I'd reach it. So I took it slow, only a mile or two to go, and watched the city come into focus in front of me. The dredge pie turned out to be small and right in front of the docks. I anchored for a moment to drop the jib then followed a local boat in through a gap. But the wind was too strong for me to even make it to the first dock, which I wasn't sure was the place I wanted to go, so I drifted past everything and came ashore on a rotten beach of rubble from a gap broken in the low sea wall. I faced her about and raised all sail, and leaped back out, dropping the foils as the water deepened, dodging staked driven in to mark the channel. It was kind of Fate to let my final act be flying up series of tight tacks between the dredgepipe and the docks, finally swooping in on a final screaming tack to the concrete dock, coming up to luff in between the wooden pilings, pulling up just right to run out and step off the nose onto the dock, rope in hand, the perfect practical ballet of good seamanship. It was my last passage on Further. The rest of the story is just details. I made contact with John, the friend of my cruising friends. They'd even called and told him to watch for me. It all worked out, with John's help, though slowly. I was more than glad to accept a casual pace as the price for success in finally finding a place for the boat. I'd already missed the date to catch the Alaska festivals, so the summer season was a moot point, I just felt glad it was a job well done, and done. I'd been happy to leave it all behind on this trip, and I was wishing the boats in Florida had sold and I was free to just keep on in Further. But I did have responsibilities waiting, and this passage was very much overextended, so I was relieved I need not continue on to Guatemala. I spent the extra time playing music everywhere around town, from the fruit markets to the street, and for friends of John and the other local boat owners at the waterfront. I found a small restaurant that served expresso and started drinking coffee again, writing in my journals and catching up the ship's log while the men at the other tables played dominos. I enjoyed it there, a city without beaches and thus, without tourists. It was really a nice clean quiet city, something that I appreciated, cities being the hardest place for me to dwell comfortably. I spent a few days dropping the mast and stripping the boat down to bare bones and putting the gear in a storage shed. I packed my gear and over a couple days almost repeated the whole journey by Mexican bus, up to Cancun to confirm my flight, and back to Chetumal to connect to the cross-border bus to Belize City and my flight out. I was immediately on a plane back to Miami, meeting the owners of Further, collecting the cat and the car, and pointing myself North, keeping moving till I reached Virginia at the end of August. note: due to several logged days being half days or less, actual sailing time is closer to 20 days. It was great, in many ways, though it was actually a grueling, hard trip. Still, it's just the type of thing that I like to do. I like the times that test you. Its not really fun, it is intense. I like the life that brings out the steel in you, the fire, the sheer ability and strength of will that it takes. I seek the energy, images, and emotions in the experiences encountered on a journey like this. It is what feeds the music; the passion and fury of a storm at sea, the gentle deep beauty of a sunset, and the nights full of stars, "when I walk the lonely beaches, and stare far out to sea..."
So I had it to do and I got it done, walked the road less traveled, in fact, the road untraveled would be more like it. You have time to think, out there, and time to not think. And you ponder the truths that make themselves obvious. "You can sail a track across the sea, but you leave no mark, instead, the sea leaves its mark upon you." Though I have "boldly done", I was actually following in the footsteps of the ancient Mayan canoes. Funny world, sure enough. The dulcimer was one of the biggest threads of the story, still. Though it just barely fit, and it was a hard journey for my old companion. It was underwater several times and soaked a lot more, not to mention the snake. I played for everyone I met, every place I went, that's the bardic way. I played on the beach and on the street, in shops and restaurants, on the dock and out on their boats for the other cruisers, for Mexican fisherman in isolated camps, for tourists and travelers. As the trip evolved, the dulci, the music, became almost the central thread. Further became just the vehicle and the journey the dulci was traveling on this time, this passage really continuing the bardic adventure of my life as a whole. The main problem with the trip was having months taken up in delays. Whether for repairs, or in finding a place to store the boat, or from the deteriorating weather as the delays used up the last of spring's good weather and pushed me right into a bad summer storm season. I never had the time to enjoy the trip, really, exploring or diving, or following up on musical opportunities. There was no time for exploring or for just foiling around, though that was also due I think to the defects in the starboard foil that made foiling so hard to accomplish. Still, I never really relaxed, though I found the trip a positive experience. I had to keep pushing, just to get the job done, as delay mounted on delay, with no sure end. I watched the summer festival season slip away, till I ended up canceling the first festival I had planned for the summer, and deciding not to book anymore. I missed going to Alaska this year, and I miss that most of all. But at least it was due to circumstances beyond my control, though that still doesn't stop me from being disappointed. Finally, all my other plans were on hold a lot longer than I planned, and no money to pursue them. But I don't regret going at all. It was worth it just to get my mind off my troubles for even such a short time and in such adverse and constrained circumstances. But even more, I was back in my life, even if the trip was less smooth as the trips I used to do, less together. It just meant that I had to do more to carry it through. It is true that I got the boat there, as much as the boat got me there. I can feel good about getting a hard job done, and still enjoying the intensity of the moments that made up the trip, even as I drove myself and Further onward. The delays wouldn't have mattered if it had been my boat, with no responsibilities to make me keep pushing, or responsibilities to make me anxious to return. I'd have been happy to continue on even longer if it had been winter, the off season, so I wasn't watching the summer festival season and the bulk of my annual income slip away, day by day. But there is always another year, and it feels much more important that I was back living the exceptional experiences that had always been such a big part of my life, "flying higher", "further". I reconnected with the life I lived in my boat "Horse”, and the rugged simplicity of small boat sailing and cruising. I was free of so many of the constraints, and comforts, of a larger boat, that much more directly in contact with the forces and elements, that much more dependent upon my skill, strength, and judgment. . There are many times when I would have been happy to just keep going, and in fact, knew I could do it if I'd been able. There is that in me that would have been content as I once was with the life of a vagabondi. I read this narrative and while the facts are there, what are missing are the details, all the scenes and moments that really make up a trip like this. Even in the details I do tell, there is a degree of restraint in my storytelling, a dry (?!) rendition of what is really a pretty wild story. Those many moments and scenes are the real story, like beads upon a string...the sunsets, the storms, the blue water, a bird's cry at dawn, an empty beach at dusk, a dusty village street in the afternoon. There are snapshot scenes of music all along the way, and the heart-stopping moments when Further was poised on a wave plunging into a narrow opening of the reef with no turning back. It was the moment when I first pointed her away from land and out into the blue water, or when we flew down through the dark and storm towards the solitary light that marked land at last, like some great bird skating and skipping over the wave tops. I remember the thoughts of a man on a solitary journey, the bittersweet sadness of talking with a sparkling girl I'll never see again. I remember the temptation to not come back, to lose myself in the wind and wave and life of the vagabondi, with a small boat and my music, and the boundless beauty of nature. My old life was calling then, when I wandered mountains and deserts and seas with the music, that less traveled road I have traveled all my life, not just the vagabondi winters I spent on "Horse". This trip reminded me as well how limited that wandering life was in the end, how much it lacked, how little you could do outside the experience itself. On the trip, I explained it to people as "the life of music", "one's life's work" and "the crazy life" too. I called it the wild life, the "pura vida", the simplicity and intensity. I said it was so like the sea, beautiful and terrible and lonely, beyond the scope of a man, yet that for a time fills you with something greater than yourself, and leaves you exhausted and exhilarated, inspired and shaken.